I have coworkers like this, where it seems like every time you see them they've got something in their teeth. And it's not always some speck of pepper or broccoli from their lunch. No, the festering lump of food caught between their teeth looks to have been there for days. It's hard to look them in the face, or concentrate on the conversation, since you keep thinking of dental floss and tooth picks. Of course, they don't have the excuse that naked mole-rats have. 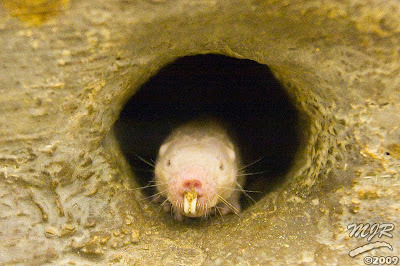 These rodents have their front teeth outside their lips, so that they can burrow with their mouth closed (such polite burrowing). I never thought of it before, but our lips also serve as squeegees for our teeth. Lookit those nubbins of ears! I love it. Also, here in Chicago, it's 6 degrees out. Seeing a nakey mole rat makes me want to knit him a sweater. Poor nakey lil guy. I'm also going to take this opportunity to attest to how UNBEARABLY COLD it is in Chicago right now (especially when you live a stone's throw from the lake!). Also: Mr. naked mole rat doesn't need your support. He knows I love him. I am afraid the sweater would do no good - according to the answer I got on Ask a Biologist they have abandoned endothermy and are now the only mammalian ectotherm, so a sweater would be as much use as a tea cosy on a tortoise.